Here’s a pair of pizzas that aren’t exactly pizza-pizzas, if you know what I mean. Oh, you don’t? Well, neither one has sauce, or any kind of tomato product. Or mozzarella. Or anything particularly Italian, except for some Parmesan cheese. What is on them is a pair of veg-focused, refreshingly light, sophisticated flavor combinations. They’re Italian in that they’re made with minimal flourish or fussiness. 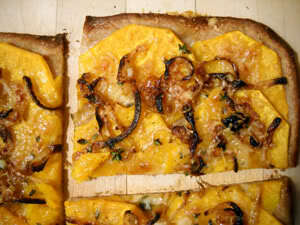 Soft, sweet slices of butternut squash are topped with caramelized onions, a bit of cheese, and a drizzle of nutty oil. 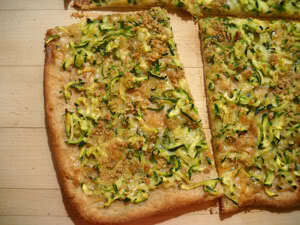 Zucchini is paired with Gruyere and bread crumbs, beautifully simple. The crust is more of the crackery-type whole wheat version I’ve been loving for a while now, courtesy of Jim Lahey’s My Bread: The Revolutionary No-Work, No-Knead Method. That recipe makes enough dough for two pies, so go ahead, make one of each version for dinner. One of the beauties of homemade pizza is its variability. Seriously, it should be in every mom’s arsenal. Because if you must, as I must, have some “normal” pizza for a challenging eater, you can just pull off a hunk of dough and make a small, separate pie in a round cake pan—I let Harry top his own and he loves it. A hint of sauce (because, god forbid he should eat a vegetable), heaps of cheese, and dozens of sliced black olives (because, we haven’t told him olives are kind of a vegetable). He’s happy, we’re happy, and life is good. Weight Watchers: The butternut topping is 8 PointsPlus per serving and the crust is 4 per. Preheat the oven to 500°F, with a rack in the center. Put 1 1/2 tablespoons of olive oil in a large nonstick skillet over medium heat. When it shimmers add the onion and cook, stirring occasionally, until onions are quite soft and beginning to turn dark, about 10 minutes. Remove from heat. Pour the remaining 2 tablespoons of olive oil into a 13 x 18-inch rimmed baking sheet—use your hands to spread it, which will help prevent the dough from sticking to them later. Scrape half of the dough onto an oiled pan in one piece. Gently pull and stretch the dough across the surface of the pan, and use your hands to press it evenly out to the edges. This took me quite a while; at first I wasn’t sure the dough was actually going to fill the entire pan. If your dough gives you any guff and springs back when you try to stretch it, walk away and let it rest for a few minutes, then try again. And if you’re like me, you’ll create tears in the dough as you go; they’re easily pinched back together. Once it’s just about touching the rim on all four sides, you’re good to go. 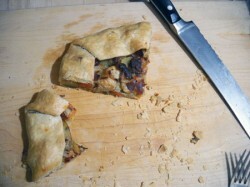 Place the butternut squash slices in overlapping layers on the dough, covering all the way to the edges of the dough. Scatter the onions on top, then the cheeses and thyme leaves. Finally, drizzle with the nut oil. Bake for 20 to 25 minutes, until the crust is pulling away from the sides of the pan and the squash is pierced easily with a fork. MAKE BABY FOOD: The squash cooks to a lovely texture for early eaters, so you can pull some off and mash it with a fork. 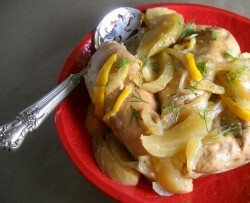 The onions are likely to be too challenging for a baby—but the crust would be fun to gnaw on. 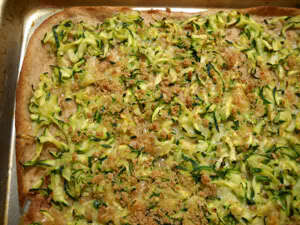 Weight Watchers: The zucchini topping is 2 PointPlus per serving, and the crust is 4 per. Shred the zucchini on the large holes of a box grater, or in the food processor. Put it in a colander and toss with the salt. Let it sit, either in the sink or on a plate, for 15 to 20 minutes, until the zucchini begins to drip. Use your hands to squeeze out as much water as possible, pat dry, and transfer to a mixing bowl. While the zucchini is wilting, preheat the oven to 500°F with a rack in the center. Pour the olive oil into a 13 x 18-inch rimmed baking sheet—use your hands to spread it, which will help prevent the dough from sticking to them later. Scrape half of the dough onto an oiled pan in one piece. Gently pull and stretch the dough across the surface of the pan, and use your hands to press it evenly out to the edges. This took me quite a while; at first I wasn’t sure the dough was actually going to fill the entire pan. If your dough gives you any guff and springs back when you try to stretch it, walk away and let it rest for a few minutes, then try again. And if you’re like me, you’ll create tears in the dough as you go; they’re easily pinched back together. Once it’s just about touching the rim on all four sides, you’re good to go. Add the cheese to the zucchini and toss together until it’s fully combined. Spread this mixture over the dough, going all the way to the edges. Sprinkle the bread crumbs on top. Bake for 20 to 25 minutes, until the topping looks golden brown and the crust is pulling away from the sides of the pan. MAKE BABY FOOD: Again, the texture you end up with for the zucchini is nice and soft. It will be easily gummed—but you could also take some of the topping and whir it in the food processor with a little broth, milk, or water. And as I said above, the crust is perfect for gnawing. Casey, if you ever do break down and try it, I think (hope) you'll be pleasantly surprised! Oh, man. 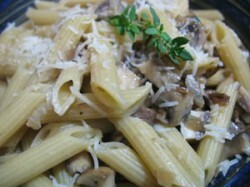 I'm wishing I had this for lunch (or dinner) tonight. That's the hard part about living in a rural area. If it isn't in the freezer or pantry, we're not having it for dinner … because it's a 25-minute drive (down an windy, steep canyon road) to the nearest grocery store. Oh my gosh–I just found this blog through a friend's link on Facebook, and my mouth is absolutely watering. I want to make these pizzas tonight, NOW (even though it's snowing snowing snowing outside, and there's no way I'm going to get into the car to drive anywhere. But I actually might have all the ingredients I need already at home. I know I don't have butternut squash (which I LOVE, but I think I do have a little pie pumpkin, and some sweet potatoes…..) And to think I was just going to make quesadillas for supper…..
Roxanne, I've never lived long-term further than half a block from *something,* but I've vacationed in remote places. It's hard! And Coreopsis, welcome! So glad you're finding things that look appealing. If you do make something, please come back and tell me how it goes! Yum, I bet it would be really cool to bake the butternut one on individual sized 'pizzas' or on naan bread. Does it get soggy if you don't eat it all the first day? Not at all, Dana! The leftovers were really yummy–the butternut especially. Sarah, the pizza dough is super-easy. I'd say foolproof, but that sounds a bit too much like a guarantee… Seriously, it requires very little actual skill.